Scene from Won't You Be My Neighbor? 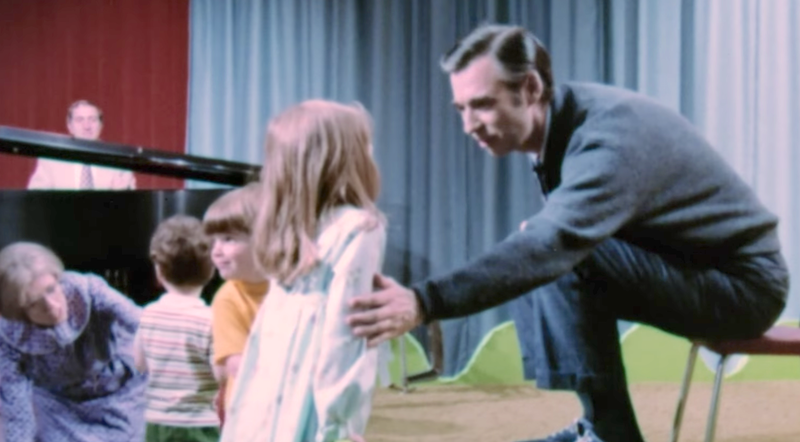 How do you make a documentary on Fred Rogers? It's actually a tough question when thinking about his credentials. He was once an ordained minister who turned to TV and became an icon with Mister Rogers' Neighborhood as the quintessential nice man. There's no real conflict to be driven from this narrative, as his actions were as genuine as his slow paced earnestness. Yet in director Morgan Neville's loving tribute to the unlikely star, Won't You Be My Neighbor?, there's a certain sense that being nice is arguably even more challenging than going for easy gut reactions that titillate in the moment but leave little to be desired hours or even days later. For Neville, Rogers is a fascinating figure not only for what he did on the show but for how he managed to live up to his integrity for over 50 years as an entertainer. He was one of the most welcoming faces on TV, and the documentary does a lot of justice to capturing why that was. It was a great exploration of the man, but for those expecting an in-depth look into his iconic show, prepare to be somewhat disappointed. It's hard to picture a show like Mister Rogers' Neighborhood ever being called radical. Yet that is the point of the documentary. The show premiered into a turbulent time in American culture, specifically 1967 with the rise of the Vietnam War protests and the impending assassination of Robert F. Kennedy. It's easy to say that tensions were high at the time and to turn to anything that didn't gratify paranoia was an act of rebellion unto itself. What's more incredible is that Rogers didn't so much provide a positive alternative, but created allegories with puppets in his "Land of Make Believe" that dedicated weeks to themes like death and divorce. This wasn't a show geared at adults, but kids. Rogers believed that talking to them like humans would be far more beneficial than humoring them. As a result, his show started its legacy not by being silly and farcical, but finding the human emotion in the most vulnerable of people. Neville's view of Rogers paints him as almost a savior to children's programming, whether it be famously giving a speech that saved local broadcasting network PBS, or even using his platform to recognize audiences that were racially, physically, or sexually different from the standards. He was a conservative man who found violence on TV reprehensible, but he accepted the audience (the proverbial "You") for who they were. Every episode was special because it felt intimate, honest, and captured a quieter side of TV. Rogers was a man who could reflect how long a minute was using nothing but silence. Even when judging the satire of him, he seemed humble and able to admit some of the value in it. Neville's journey through the man's career captures many of his fine achievements that made him an icon, including a late-in-life controversy as to whether he was responsible for "participation trophy" culture. While the film does an excellent job of explaining the importance of the show, it's inevitable impact comes from how it explores Rogers as an individual. It is a talking heads documentary that tries to peer into the head of a man who looked to not have an evil bone in his body. What was working with him like? The answer is far more perplexing than the crafted sets would suggest. There are candid interviews (including one about a funny picture) that add personality to a man that was inevitably a perfectionist, trying to control every aspect of the show in a manner that reflected his personal beliefs. The puppets he used embodied deeper hidden emotions, notably Daniel the Tiger, about a man who grew up being bullied and in the process gained sympathy for people's differences. From the archival footage, old interviews gain life as simple actions get a depth never before accessed to the general public. For a nice man who exceeded all of us, he was a perplexing yet familiar artist. The documentary gains its appeal when it centers in on Rogers as an artist who is troubled. While he never had a public breakdown or even so much as a career lull, there is a sense that the job of being on Mister Rogers' Neighborhood was hard for him. He consistently doubted himself as an artist, choosing to believe that his potential wasn't good enough. He was a man who preached confidence in children, which makes the revelation of writer's block all the more jarring. It also revealed just how kindhearted he was that none of this underlying grief ever appeared in his work, at least in a cynical fashion. Instead it became text for the show, reflecting that Rogers was human and wanted to talk to anyone that would listen about the struggles that came along with it. Won't You Be My Neighbor? provides a lot of grand insight into Rogers as an individual, though misses out on capturing a lengthier exploration of the iconic show. By choosing to emphasize points that reflect Rogers' creative process, Neville captures a depth of character that paint the quintessential nice man as something greater. He wasn't perfect, just not in ways that are seen as self-destructive. He was a man of hope, which is pretty easy to relate to in a modern environment where a Rogers type would once again be seen as radical. It's not a necessarily deep story that changes any perceptions about Mister Rogers' Neighborhood, but it gives a sense of how humanity can conquer through the hard times. Rogers wasn't shy of public debates, and he made the world better for it. He showed that he could persuade without being crass. He was a revolutionary, even if he never did anything reprehensible. Labels: 20 Feet From Stardom, 2018, Best Documentary, Fred Rogers, Morgan Neville, Won't You Be My Neighbor? Good points made here. It was a fitting tribute to the quintessential nice man.